"She'll give you these looks that just speak a thousand words." She may never be able to run or dance, but her mother believes that she can express so much with just her eyes. Florence McNicoll’s delayed development filled her mother Caroline with panic when the tot failed to meet the usual milestones at seven months old. Doctors finally diagnosed the two-year-old with a rare and incurable neurological disorder similar to cerebral palsy. The news devastated Oxford parents-of-three Caroline (33) and Al McNicoll (34). A heartbroken Caroline keeps herself going by believing that Flo has the ability to say a thousand words with her eyes. "She’s really bright and she has a totally normal level of understanding but she can't speak. She does try but she is amazing at communicating with her eyes. "She's got a book she can look through to tell you what she wants and she’s so expressive. She'll give you these looks that just speak a thousand words and she's got a great sense of humour,” Caroline says. Flo has such an expressive face and mischievous sense of humour that she’s “adored” by her brother Élysée (8) and sister Poppy (6) and everyone she meets. 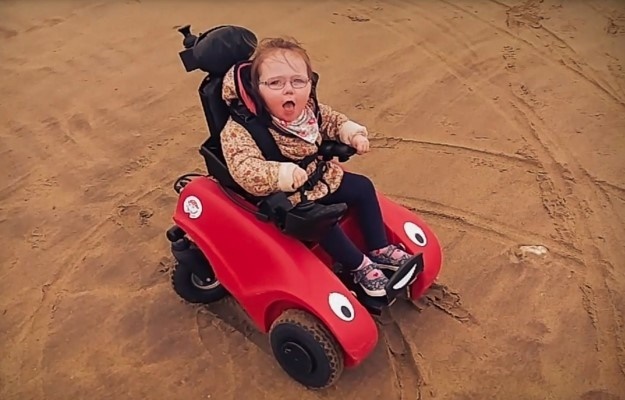 And the tot's determination despite her disabilities has made her family realise that you don't need to be productive to be a useful part of society as Flo brings joy wherever she goes. Despite having a completely normal pregnancy, church volunteer Caroline and assistant pastor Al started to panic when by Christmas 2015 Flo hadn’t managed to sit up, crawl or babble. Full-time mother Caroline, said: "Flo's condition means she can’t move herself about at all. If you put her down somewhere, she’ll stay exactly where you left her. After a visit to their GP the family began an “emotionally exhausting” journey of physiotherapy, blood tests, MRIs and neurological scans before Flo was diagnosed with a static dysmyelinating disorder. "When we finally got a diagnosis we were just relieved that we had an answer and we could start getting on with our lives. We’re so fortunate that it’s not progressive or life-threatening. "This might not be what we expected for our little girl but you just take life as it comes.